According to Global Workplace Analytics almost 25 per cent of Australians work at home at least one day a week. This is thanks to growing acceptance of flexible work and the increase in self-employment, both borne most notably on the inherent abilities of working via the internet. To successfully work from your home, it makes sense to create an inspirational and stylish home office. One of the major trends in home offices is having inspirational glamour in our working spaces. In an Instagram-driven world, our home offices can be seen as part of our brand. This is influencing a more stylised space that adds to your image and the style of your home. Regardless of your preference of interiors, the office essentials would at minimum include a desk, a chair and storage. But that does not mean these pieces have to have a dreary corporate look. 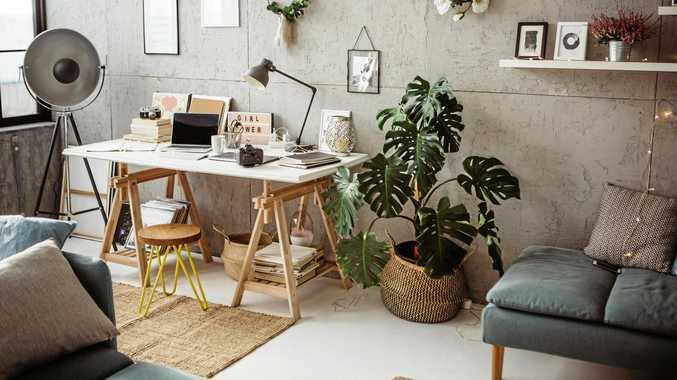 For your desk, you could go the traditional route with a timber desk, you could re-purpose a dining table or choose a funky trestle or perspex table. Your next must-have is a chair. Whether you choose an ergonomic executive chair or a beautiful antique chair, ensure it is supremely comfortable. The next element is storage. Here there is an abundance of choice from retro to re-purposed pieces to classical filing cabinets. When it comes to lighting, choose what helps you to stay focused and in the zone. For decorative items choose inspirational pieces such as a vision board, framed photos, an uplifting candle, art and lots of lush plants. Natural greenery will improve the air and represent growth and prosperity - all of which adds to productivity output.